These past 9 weeks have been such a learning experience for myself. I can’t believe how fast time has gone by! Over these past 2 weeks I have struggled with being a little under the weather, but that hasn’t stopped me from allowing my body to rest a few days and then getting right back into the swing of things. My upper body and back continue to lean out and show definition. My lower half (meaning my legs) are definitely building muscle but not leaning out as quick as I would like. I know that I have to be patient and your lower body and stomach (especially) take longer, these are the trouble/stubborn areas for woman. With this said though my core stability and strength is developing and I continue to chisel away at my ultimate goal! 6 pack abs! This week I have 2 inspiration pictures, the first has no quote, it’s simply one of my favourite pictures lately of No doubts lead singer Gwen Stefani. She has always had amazing abs, but this picture inspires me in so many ways. I love how Gwen has been a top fashion icon for years and she continues to Rock It. I love the whole outfit, her blond hair in a bun (my old go to do which I’m aiming for again) and beautiful healthy abs. Once I have achieved my fitness goal and have rock hard abs, I will remake this shoot. So in my eyes this picture represents a 1000 words and inspiration. This week with being on the go and still feeling under the weather, I did not have a huge appetite and found it hard to eat as much as I have been. I made sure to eat as much protein as I could handle and small meals more often. One thing I could stomach was my oatmeal in the mornings. I added berries and nuts to make sure I loaded up on my nutrients and antioxidants. I decided to add juicing this week to make sure I was getting my veggies in my system. My favourite came from an inspiration from Jugo Juice~ kale, spinach, berries and beets, it’s called “Can’t Beet This”. One thing when you are feeling run down or sick is to make sure to stay hydrated, this is even more important when your not feeling well. I love my second picture quote, I now realize how to incorporate fitness into my every day and there really is no more excuses.There is no such thing as quitting anymore and I plan to finish what I started. All anyone really has to do is get over the mental struggle we all go through and check self doubt at the door. Anyone can accomplish anything the set their mind to. On this past weeks check-in with my trainer Hanan, she asked me to send my pictures wearing a bikini (which was a scary thought). Well I have to say that I bought this bikini that was a few sizes too small a few years back and it’s finally starting to fit. It was so encouraging and exciting to think of bikini shopping for the summer. Alright week 10, I’m ready for you~ BRING IT ON! It’s official, I have pasted the 2 month mark and could not be prouder of myself. In such a short amount of time I have learned so much about myself and that my fitness goals are in my reach. 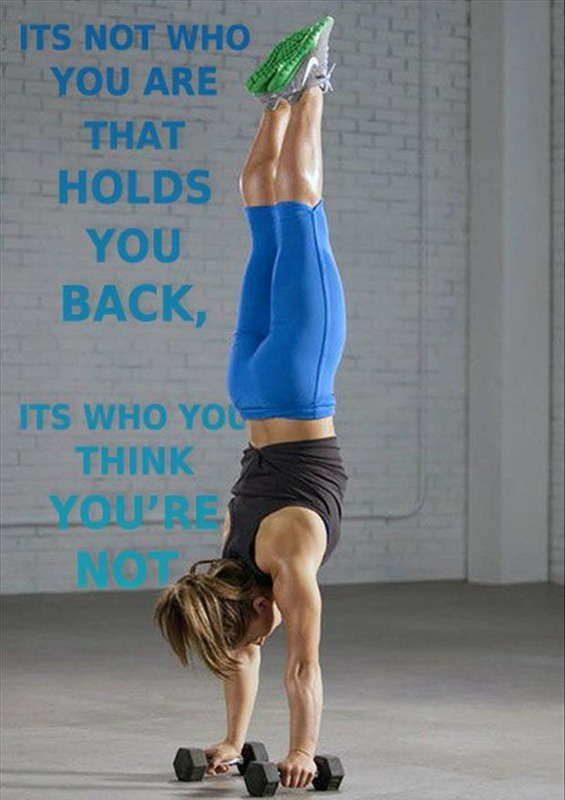 I absolutely love, love, love this quote pic as it sums up the mental struggle I have dealt with my whole life when it comes to my fitness. There have been so many times that I have doubted my ability to be able to workout as hard as I have and to achieve the results I have done. Honestly I now know that anything I dream off or wish to accomplish I can do! Over this past week I have had some long work days and previous to starting this fitness journey may have let temptations win, but not now! I had a few circumstances where I was tempted by food and still stayed focused and managed to avoid them. I haven’t really had any major cravings like I use to have and find that creating new healthy recipes is becoming fun and more easy to do. This past week I started experimenting with what I was cooking and decided to post a picture of one of my dinners. I am obsessed with kale at the moment and just can’t seem to get enough. As we all know eating any vegetable in the raw form is always better than it being cooked as it can lose some of the nutrients. So what is it that I did with my dinner you ask, well let me tell you. 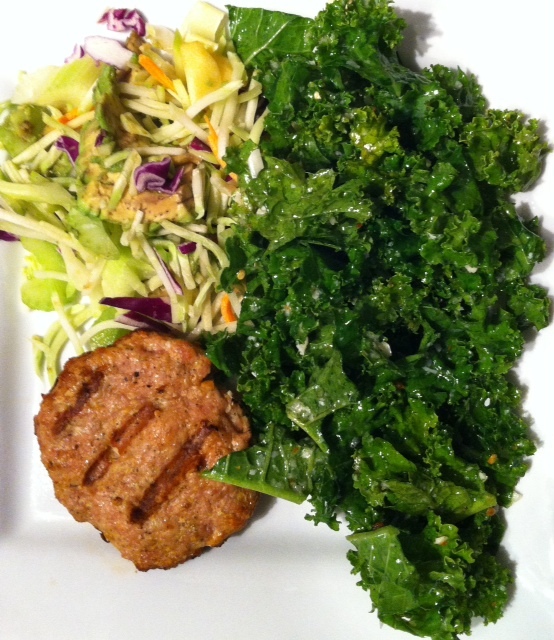 I took ground turkey breasts, mixed a bunch of herbs from my kitchen, added a few egg whites and formed into patties. I then grilled them. Next I took brocoli slaw salad (prepackaged) and added an apple and a bit of avocado to it. For the dressing I mixed together small equal amounts of olive oil, lemon juice, balsamic vinegar, yellow mustard and a drop of honey. So tasty, easy to make and not a lot of calories. For the Kale I took raw kale (broke into pieces) and a dressing I made and marinated it for 30 minutes. The dressing was really simple, mix raw garlic, crushed chilli flakes, raw grated parmesan, lemon juice, olive oil and ground pepper to taste. The lemon juice in the dressing slightly cooks the kale while still keeping it crisp. I can’t tell you how great this meal tasted, so much that I crave it every night. I felt full and had tons of energy. Kale has so many health benefits including iron which I run low on with not eating any red meat. This past week I had numerous people start to tell me that they have noticed how I’m looking more fit. It’s really encouraging to look in the mirror and see the transformation, but to have others compliment you on the hard work you’ve put in gives you some added boost. I am noticing my stomach starting to get definition and the start to a 6 pack. I have gained a lot of muscle in my legs and each day feel stronger and stronger. With feeling run down this past few weeks and fighting a bug, I am just starting to increase my cardio, but with this added strength I’m finding it easier to do. I am continuing to take my BCAA’s and Glutamine and definitely recover after each workout faster. My three favourite exercises are 21’s, one leg squats and sumo squats. I’m looking forward to starting my week 9 and seeing my body continue to change. Seeing that only a few months have passed, I can not wait until Summer when I will be 100% beach ready! As little girls (and some little boys too), I think we can all look back and remember playing dress up and having tea parties. I also remember my grandmother’s exquisite china tea sets, hand crafted and designed with beautiful roses. Tea time held such wonderful memories, it’s probably because of that I still get such a feeling of love sipping on a warm cup. In May of this year I was invited to the opening of New York- based Tracy Stern’s SALONTEA, which opened its first ever Canadian boutique in Vancouver (with President Sarah Ambrose). I had heard about the New York location and tea before as Oprah is fond of the brand. I wasn’t sure what the night had in store but soon found myself in my very own “Alice in Wonderland”. I took the occasion to dress up in one of my big Betsey Johnson dresses all decked out in black frilly lace! Upon arriving I was instantly mesmerized by the decor and colors that filled the room~burnt orange, hot pink and chocolate-brown. I wanted to find out more about the concept and was directed to the entrance wall. There laid out before me were seven different cut out mirror images~ The Writer, The Society Hostess, The Romantic, The Lover, The Artist, The Musician and The Fashionable Dandy. I was told to see what image grabbed my attention and that would be the tea of choice. I was of course drawn to “The Writer“, which I found out was Oprah’s favourite too (love this)! I mingled and engaged in wonderful conversations while enjoying a selection of teas, an array of delicate sandwiches, sweet treats and some sparkling champagne. My attention then turned to a display in the middle of the shop, on the shelves sat BEAUTEA products and perfumes which are made from tea. I was very curious and had to learn more. I had the opportunity to meet Tracy Stern that night and I can honestly tell you she was beyond lovely, gracious and the perfect hostess. I was drawn to Tracy’s concept, devotion and love for the essence of beauty. We sat and chatted for quite some time and she indulged me in her world of tea. The conversation soon turned to beauty talk and we ended up sharing our favourite lipsticks, hers being Tom Ford’s Red and mine (at the time) YSL’s Coral. I explained what a huge fan of tea I was and that I loved taking baths. She mentioned that I should definitely try “The Writer” tea bath sachet and roll on tea perfumes. The perfumes were amazing, with such captivating, enticing and alluring scents. I took some of the tea sachet’s home and it was like indulging in a cup of chai tea (see a previous post here). I was in total heaven. I picked up a copy of Tracy’s new book “tea party” and she graciously signed with a personal note. The whole night was a fabulous experience and I absolutely love the concept. It really is a perfect place to relax during an afternoon or to host a tea party. This takes tea parties to the next level. From the moment I met Tracy I knew without a doubt that she would be someone who I would like to feature on BB411 for a Beauty Q&A. 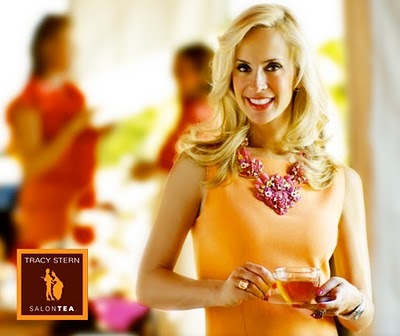 So go grab your favourite cup of tea, sit back and learn more about life and beauty with Tracy Stern. TS~Since I was a little girl, barbies, fashion and simple luxuries like taking bubble baths were always my world. My mother dressed me well & I have an award from kindergarten for “BEST DRESSED AWARD”! Today in a NY magazine I am still voted best dressed. BB411~What is the story that brought you to creating “tea party” and the beauty line? TS~”tea party” the book-I have and always have a million ideas and inspirations for creating special events, decor and gorgeous table top ideas. Plus I love people and being surrounded by friends . I love the element of surprise and fantasy and want to create that for my guests while being old-fashioned and bringing people together. BB411~What is your earliest memory with tea and tea parties? TS~As an only child I would have tea parties for my dolls and remember my grandmother cutting out circle tea sandwiches for me with egg salad. Very sweet and simple. BB411~Do you use tea for your skin care? TS~I love beauty and purity. Using tea which naturally rejuvenates the skin cells on skins first layer of epidermis. You can actually spray brewed tea to balance the ph levels. As well it actually helps sunburns too. BB411~Where do you see your business going in the next 1, 5 & 10 years? BB411~Are you involved in any charities, are any close to your heart? TS~I am involved in numerous charities in NYC and internationally . My latest NFTE just honored me for helping young entrepreneurs & I’m especially fond of all my charities to help children and women in need. TS~I would tel my younger self that everything that happens is the way its meant to be. Let go and enjoy life and all opportunities that come your way. TS~People don’t know I’m a skateboarder! I have been skating and doing tricks since high school – freestyle and old school. I love to travel internationally and now will start writing a jet set blog and national column for travel at pink memo. Balanced and Fit……a fitness journey! So I just finished week 3 of my fitness plan and I have to say that I am definitely feeling like my body is leaning out. I don’t see a lot of increased muscle definition at this point, but after talking to Hanan she reminded me that it has only been 3 weeks. I think I am like most and want immediate results! Patience is not one of my virtues, which I am definitely working on. I’m a firm believer that to achieve your fitness goal you need to combine diet and exercise. This past week I found this quote picture and could not agree more. My trainer Hanan actually feels it’s more like 80% diet and 20% gym, which goes to show how important it is to watch what types of foods you’re putting in your body. Since focusing on eating clean, my body weight has started to shift, which is encouraging to see. This past week I did really good with my food prep, I ate fiber/protein powder/egg white pancakes each morning, went shopping and spent a night cooking and portioning out my food for the week. During my trip to the grocery store I stayed focused and loaded up on necessities like egg whites, purple yams, green veggies (broccoli, beans, spinach, celery, brussels sprouts, cucumber), turkey breasts, salmon, tilapia, ground chicken, low sodium hummus and fresh salsa (very low sodium). One thing I recommend when following a fitness plan, is to not go to the grocery store hungry. This leaves way too much temptation for you and can be discouraging. It’s especially tough when you are going through the check out and right in front of you is the whole display of chocolate bars, WHY? I definitely think this set up needs to change! 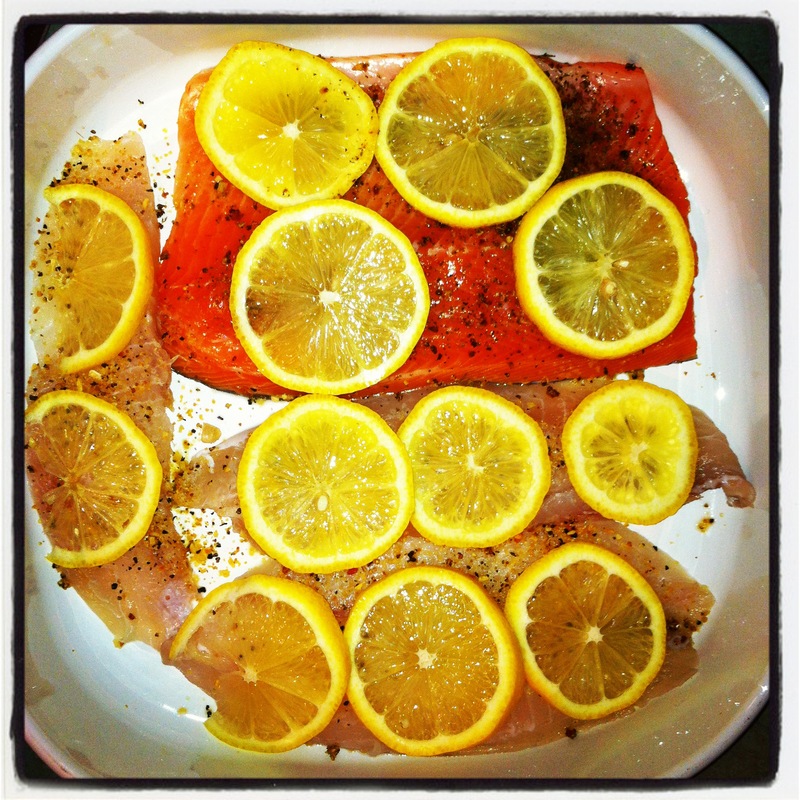 I cooked up my protein (salmon, tilapia and turkey breasts) with a variety of Mrs.Dash herbs and put fresh lemons and limes on each protein portion before I baked them. One thing Hanan advised was to try to mix up my protein sources so I don’t get bored. I steamed broccoli, green beans, spinach and brussels sprouts. 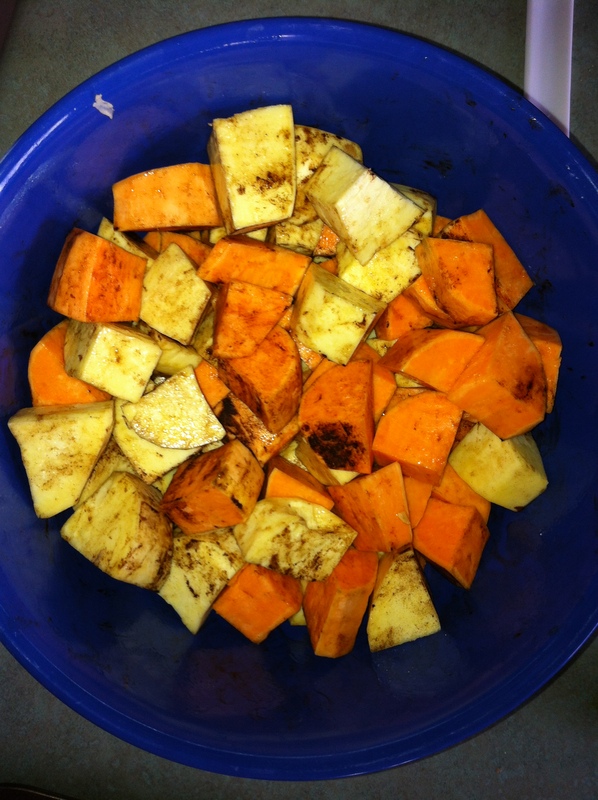 For my Carbs I chose Purple Yams (why are they not purple), which I steamed. 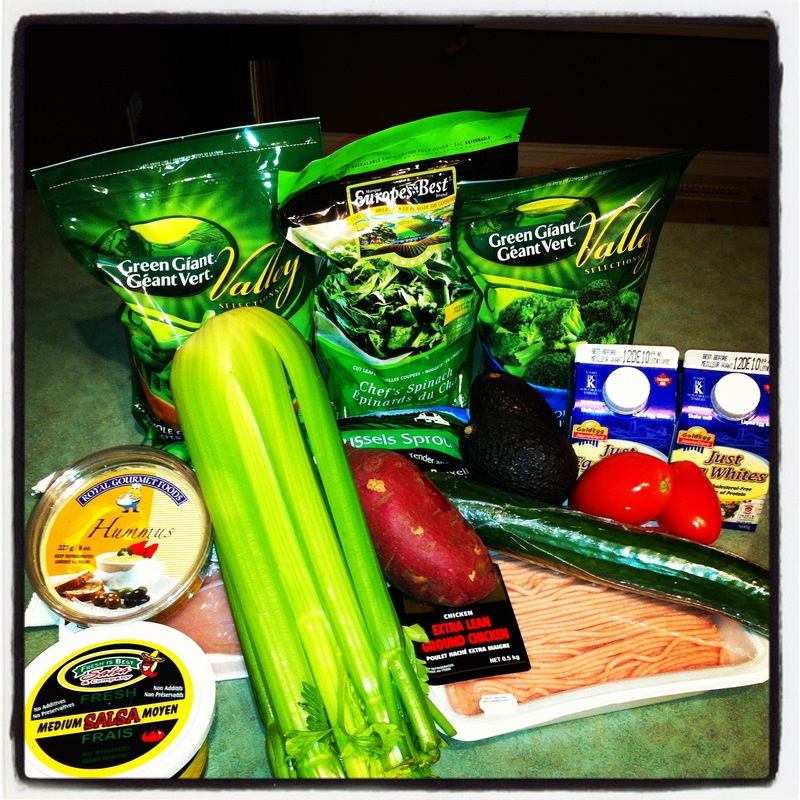 One thing that is important is making sure you are weighing your protein and carbs. I picked up a handy little scale that doesn’t take up too much room in the kitchen. This is crucial to make sure you are staying on target, and if things are not progressing the way they should your trainer can adjust accordingly. I have been using mustard, low sodium salsa and hummus (but only 1 tsp at a time). My cheat meal of choice this week was again (of course) PASTA!. I had mushroom stuffed ravioli with a rose sauce and topped it off with dry curd cheese (for added protein). My workouts this week were good, though I don’t think I am lifting heavy enough as I should. I think it may just be that I am still at the beginning of the plan. I definitely am getting use to keeping water on hand always and staying hydrated. Again this week I have slept better and had no mid day headaches. I actually went to reflexology this week and think that helped with the sore muscles. As advised per Hanan, I have started taking Glutamine and BCAA’s to get the most out of my workouts and recovery. Thank you to my personal trainer Hanan Arabatlian from Hanan Fitness for my fitness program & Steve Nash Fitness Clubs for sponsoring my training at their various gyms.